the mystery of the ingrown hair! Most people get them, but why don’t we talk about it? Anyone who has ever shaved or waxed will no doubt be familiar with ingrown hairs and well aware of the pain, irritation and embarrassment they cause. As a therapist, I’ve seen many ingrown hairs and the most memorable ones are the ones that have been squeezed, picked, plucked, dug out and cut at by frustrated clients looking for a solution. More often than not, this leads to infection and potential scarring. No one wants to have ingrown hairs! They’re unsightly, sometimes painful and itchy causing much discomfort, sometimes so bad that some people give up on a specific hair removal method altogether. Why suffer through of all of this when solutions exist?!? I thought the best place to start this piece is to explain what an ingrown hair is and why they occur. To put it simply, an ingrown hair is a hair that does not emerge from the follicle but remains embedded in the skin, usually causing inflammation. Ingrown hairs can occur after hair removal when dead skin cells accumulate and form a papule as the skin heals. Hair growing in the area gets trapped under the papule and is prevented from exiting the skin, creating an ingrown hair. Irritating and unsightly ingrown hairs can occur on any part of the body however are most common under the arms, bikini line, legs, chest and on the face/neck for men. Ingrown hairs and other problems associated with hair removal vary from person to person and can be more prominent depending on hair and skin types. Most people are embarrassed when they have ingrown hairs and therefore don’t talk to their therapist, pharmacist or friends about them. They are left to figure out this pesky problem on their own. The truth of it is that ingrown hairs are just as common as any other skin concern. We always talk openly about treatments for common skin issues within a facial treatment; cleansers, toners or moisturizers, so why are we ignoring the obvious when it comes to other issues? It’s not just women who are affected by ingrown hairs. Men are also extremely prone to ingrown hairs and shaving rash due to the coarseness of their hair. Bump eRaiser Triple Action Lotion or Concentrated Serum have been specifically formulated to treat and prevent shaving rash on the face, chest and body and work amazingly well. I always make a point of talking about treatment and prevention products to my clients and often they come back thanking me for getting them onto a product that has relieved them from the ingrown hair battles! After all, it is just as important for your skin to be as smooth, as it is hair-free! Today is the day to remove the awkward mystery and start the conversation about ingrown hairs! It’s time to banish the bumps! You’ll be surprised by the results; change in attitudes and well, your smooth bikini line will speak for itself! My top 5 tips for smooth skin! Exfoliate daily! The removal of dead skin cells will aid the prevention of ingrown hairs as there will be less chance of the hair getting trapped under the skin. Try Bump eRaiser Exfoliating Mitt, It’s a must have for every shower! Made from Italian fabric, the unique blend of fibres massage away dead skin cells, improve circulation and leave the skin feeling soft and smooth. Do not touch! If the hair cannot easily be lifted with a pair of clean tweezers (without breaking the skin), leave it alone! Find the right product for your particular concern. If you’re a stickler for routine buy a product that will help in the prevention and elimination of ingrown hairs. Try Bump eRaiser Concentrated Serum – it’s in a spray bottle so is ideal for treating large areas like arms, legs, chest and back. If you’re someone who forgets to use a product daily, go for a treatment only product designed to be used once an ingrown appears. Bump eRaiser Medi Paste is a highly concentrated spot treatment to treat the ingrown once it has appeared. It’s the most popular product in the Bump eRaiser range! Don’t be fooled by price. The most expensive treatments for ingrown hairs are not always the best. Always look for product reviews and testimonials and if possible ask for a sample first. Each product within the Bump eRaiser range retails for $16.75. It’s a small price to pay for bump free skin! Other ailments! If you’re also suffering from other bumps, pustules and pimples Bump eRaiser Medi Paste can aid these concerns too as it actively reduces redness and swelling and prevents infection. 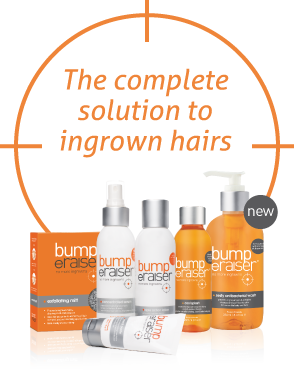 Bump eRaiser Triple Action Lotion even works to retard hair growth and reduce the discomfort of waxing! Multi-purpose all-rounders, a must for every bathroom cabinet!